Home General Information Health Issues How Many Teeth Should an Adult Have in his mouth? How Many Teeth Should an Adult Have in his mouth? Human teeth are made up of phosphorous, calcium and other minerals. Human teeth as compared to animals are quite small in size. Teeth are very important because without them no one can chew, crush or grind food. Even we cannot speak if we don’t have teeth as they help in articulating sounds and words. With the help of teeth, we can easily break down the food into small particles which are easily digested in our stomach. During the prenatal stage, the babies experience the development of the teeth. Initially, the teeth are not visible, but as soon as the infant turns 5 to 6 month old, the teeth start becoming visible. By the age of 2 to 3, most kids grow 20 teeth which are known as milky/deciduous teeth. Since the milky teeth are not permanent, they begin to fall at the age of six. Replacing the baby milky teeth, the adult teeth start growing and they are for the life time. A baby has 20 milky teeth whereas an adult human being has a total of 32 teeth. As a person grows more 12 additional teeth appear without disturbing the position and location of the 20 baby teeth that already exists. Every adult should have total 32 teeth comprising of 8 incisors, 4 canines, 8 premolars, and 12 molars. The molar teeth consist of 4 wisdom teeth which develop and become visible at the age of 18. CANINES: Very sharp teeth with pointed edges. They have the longest root and the strongest tooth. These teeth start to grow when the child is 20 months old. These are four in number and developed after the incisors. The lower canines grow and erupt earlier than the upper canines. Their function is to tear the food, especially meat. MOLARS: Every adult has total 8 molars, four constituting the upper jaw and four are presents in the lower jaw. They help us to chew the food properly. 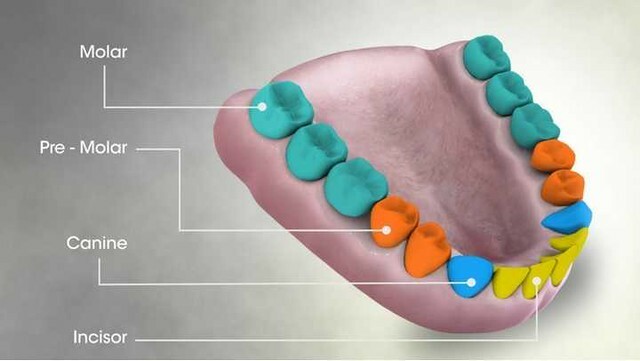 The third molars appear in the last and they are known as Wisdom teeth. They start to appear at the age of 18. Most people never grow third molars and many get rid of them as they may cause pain.